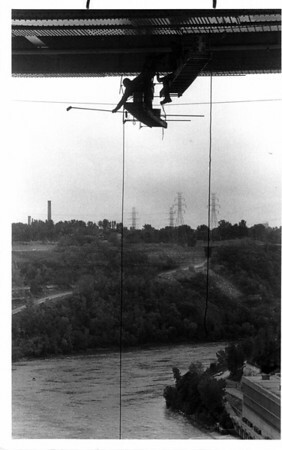 Silhouetted high above the Niagara River are Erie Painting, Inc. employees (Lancaster). Jim Taylor, John Tyler and Bill Eadie. They dangle on ladders hanging from the Lewiston - Queenston Bridge while painting its underside. Photo - By Lisa Massey - 10/18/1987.